10-Jun-2014 -- After several days of successful confluence hunting, I was due for a disappointment, and today I got one. From studying the map, and reading the report from the previous visitor (in August 2007), I thought that this was going to be relatively easy - especially compared to my difficult slog to reach neighboring [49,-115] the previous day. It looked simple enough: From Cameron Lake, hike up the Summit Trail, then down the Boundary Creek Trail towards the Canada-US boundary, and the confluence point. What I hadn't anticipated, however, was that in early-mid June, the top of the Summit Trail would still be covered in snow. I should have anticipated trouble when I arrived at Cameron Lake. Parts of it were still icy, especially towards its southern end (sheltered by a steep, snow-covered north-facing slope). 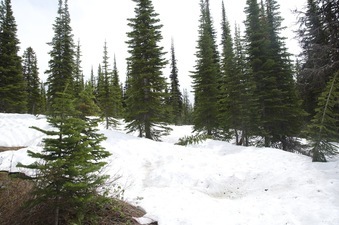 And when I started hiking up Summit Trail, I soon encountered patches of snow. At first, these were easy to hike over. But then, as I got closer to the summit, the snow banks became more numerous, and deeper. Eventually, the whole trail was covered in snow (in places, up to 2m deep), and I soon found it impossible to follow the trail. If I had had the foresight to have noted a waypoint for the junction of the Summit Trail and the Boundary Creek, then I could perhaps have used my GPS receiver to navigate to this point, and then continue down the Boundary Creek Trail. Because that trail - unlike the Summit Trail - is on a north-facing slope, it is likely that it would have been mostly clear of snow, as (probably) would have been the international boundary clearing, and the confluence point. However, without a waypoint for the Boundary Creek Trail, I found myself unable to continue - 2.2 km (as the crow flies) from the confluence point. In some future year, I hope to return - in July or August, but not June - to try again to reach this point. #1: This is as far as I could get on the Summit Trail. At this point I was 2.2 km (as the crow flies) from the confluence point. In the Waterton Lakes National Park. The borderline with the U.S. is running about 150 m south of the Confluence.